We released Mr Uptime, our new Firefox extension, to the public last Friday. Only three days ago, in other words, and the launch has already been a great success. Google tells the story – from 0 to 11,000 in 3 days. Before last Friday, doing a Google search for “Mr Uptime” would barely give you any results at all. On Saturday this had increased to ~50 results. 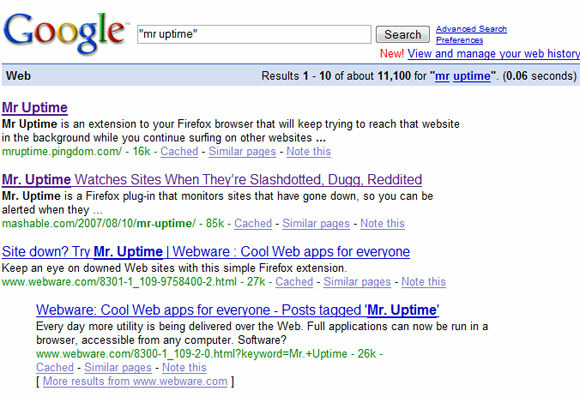 Today, Monday, you get more than 11,000 results for “Mr Uptime”. Mr Uptime has already received plenty of coverage from around the web, including becoming the daily download at CNET’s Download.com. Webware (CNET) – Webware is a very popular CNET blog about web applications. Mashable – One of the top 100 blogs in the world and the largest on social networking. Firefox Facts – A highly popular blog with tips and tricks about Firefox. CyberNet News – A popular tech and productivity blog. Very much thanks to all this buzz, Mr Uptime is off to a great start, and we would like to thank everyone who wrote about it and helped spread the word of this very useful Firefox extension. And of course, thank you to all of you who have already started using Mr Uptime!